Did you know that Marjoram is known as the ancient herb of happiness? Yep, we are pretty sure that Pharrell was really singing about this little beauty! With its sweet, earthy, yet mild flavor marjoram can be a substitute for oregano and is best-in-class for veggies, poultry, soups, and especially sauces. No stems please! And shh… the word on the street is marjoram is BBQ’s secret weapon. Sold at the peak of freshness. Our Marjoram is grown and sold to be used right away for the best flavor. Cause marjoram makes us happy! Triple the amount you would use for dry herbs and add just before serving. 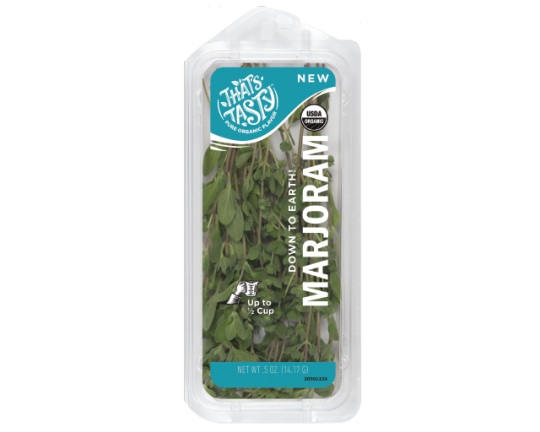 Marjoram is happiest inside its package, hanging out in your refrigerator drawer. Have extra Marjoram? No problem. Try these fresh ideas for how to use it quickly. Make an infused olive oil. Place the marjoram in a sterilized mason jar and top with a quality olive oil. Cover the herb by at least 1-2″ of oil. Place oil in sun and let infuse for 4-6 weeks. It’s great if you can shake the herbs in oil daily during this time. Then strain the herbs and place in a clean sterilized jar for use in salad dressing, in a marinade, dipping oil … the possibilities are endless!